Now that the hotter weather has arrived, many families are gearing up to take full advantage of the summer holidays. What better way to spend quality time with the family than on a camping adventure? Camping with babies and toddlers can be challenging for sure, but it can also be heaps of fun if you go prepared. One thing you should definitely familiarize yourself with before you set off is campfire safety. Unsurprisingly, campfires attract babies and toddlers like a moth to a flame. They’re mesmerized by the flames, the heat and even the sound of the fire. However, they don’t yet have any understanding of fire safety. For this reason, the majority of children’s camping related injuries tend to be campfire related. 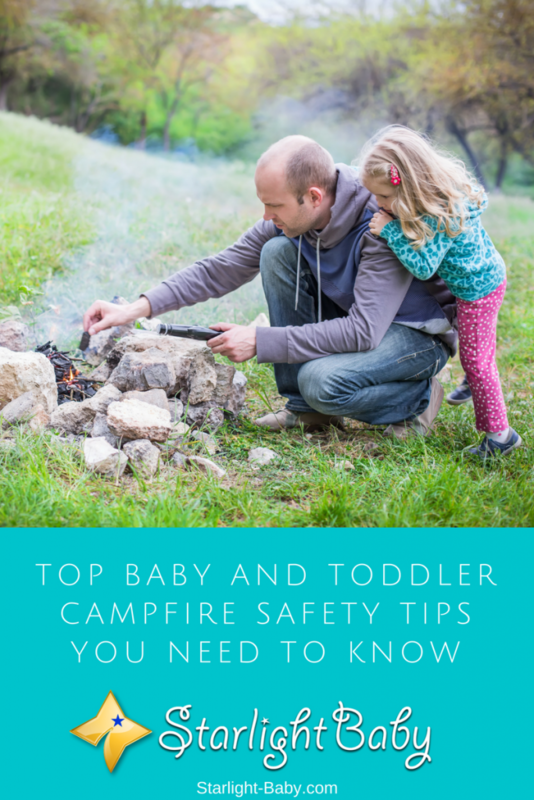 If you’re looking to keep your little one safe this summer, below you’ll discover the top 8 baby and toddler campfire safety tips. This one might sound a little too obvious, but it’s actually pretty easy to forget once you’re out in the bush. Sure, you may remember to supervise your little one the majority of the time, but with so many things going on around you, it’s easy to take your eyes off them for a few seconds. This is how many toddler campfire incidents occur. If you find you need to take care of something, ask another adult to keep an eye on your baby or toddler. It’s important to stress “adult” here, as even though older children may be perfectly capable of watching your little one for a couple of minutes at home, around a campfire is a totally different thing. So, it’s always recommended you leave the supervision to adults only. Campfire safety actually starts before a fire has even been built. Did you know there’s a right way and a wrong way to set up a campfire? If you don’t follow certain guidelines, you could end up with an out-of-control fire which can be extremely dangerous, not just for your baby or toddler, but for the whole family. Ideally, you’ll want to use a pre-prepared fire pit. However, if you don’t have one, it’s worth paying attention to the advice of the U.S. Department of Agriculture Forest Service. They recommend choosing a location which is far away from any tents and under the open sky, rather than under branches. They also suggest the hole for the fire should be two feet wide and six inches deep. It should also be surrounded by either a ridge of dirt, or rocks. Dry leaves, twigs and tinder can be placed into the center, ready to be lit. Now, this doesn’t need to be an actual huge fire extinguisher, but it does need to be something that’s going to help put out the fire if needed. A bucket of water or sand could work really well. If you choose the latter, be sure to have a shovel nearby too to both pour the sand onto the fire, and pat it down to extinguish the flames. If using an actual fire extinguisher, be sure to keep it far enough from the fire not to be exposed to heat, but close enough to be grabbed in a quick amount of time. Fire extinguishers exposed to heat can become less effective, especially over longer periods of time. If you’ve ever tried lighting a campfire, you’ll know it’s not as easy as it looks! Therefore, it can be tempting to take along accelerators such as methylated spirits / denatured alcohol and gas to make it easier. The trouble is, while methylated spirits and gas can definitely help get the fire started, they can also cause the materials to ignite much quicker than you anticipated. You won’t always see the ignition before you get burnt, depending upon which accelerator you have used. So, if you want to avoid a potentially out-of-control fire, or potentially singed eyebrows, stick to using natural materials such as twigs. As well as ensuring the fire is far enough away from tents and other potential flammable objects, you need to ensure there’s no clutter surrounding it. If things are left lying around close to the fire, there’s a real risk you, or your toddler, could end up tripping over; potentially landing in the fire. What camping trip would be complete without roasting S’mores over the fire? Many families have awesome memories of sitting around, roasting S’mores, laughing and eating together. However, while it can be a wonderful bonding experience, when it comes to toddlers, you should never let them roast their own S’mores. Even if they’ve mastered feeding themselves, toddlers are still renowned for being clumsy. It would only take a split second for them to burn themselves and it just isn’t worth the risk. So, be sure to tell them the roasting part is an adult job. Additionally, if one of the marshmellows catches on fire, do not let them blow it out. In some cases, burning marshmellows have gotten stuck to children’s faces, resulting in very severe burns. Toddlers do understand basic rules so it’s a good idea to talk to them about the potential dangers of campfires. Be clear about the rules such as don’t touch the fire, or even go too close to it. You could even mark an area away from the fire with a rock or another object to clearly show them how close they can get. Don’t just provide a list of rules though. Use it as an educational activity. Talk to them about why fires are built, the potential dangers and how they can safely be interacted with. Toddlers love learning new stuff and they’ll be more likely to follow the rules after a discussion about the dangers of fire. Camping can make for a great learning experience, so pull all the lessons from it that you can! It’s easy to forget the dangers of campfires don’t just stop the minute the fire has been extinguished. Unless it is put out properly, the fire could re-ignite, or at the very least, cause burns if it is touched. Hot coals can cause significant burns for up to 24 hours. So, make sure you properly douse the fire and check that the coals are cold before you head to bed. Overall, camping can be great fun, even with a baby or toddler! However, when it comes to campfires, it’s essential you follow the safety tips above to avoid potential injury. Have any campfire tips or stories to tell? We’d love to hear them! We have actually never gone camping with our son before because we always thought that he’s not old enough. At what age would you recommend for it to be okay? Anyway, we definitely plan a camping trip in the near future. Why? because it’s an amazing bonding time and there’s nothing better than to spend some time together in nature, apart from the noisy town. I also think that kids can learn a great deal from camping out. But, of course, the campfire is essential so thank you for the tips. Especially the one about S’mores! I would probably let him roast his own since he’s good at persuading me, haha. He does know the general thing of ”fire is bad” and ”don’t play with fire” though and seems to obey it very well. Hello, Jane! I’ve checked out some suggestions regarding the appropriate age to take a child to camping and found that there’s no prescribed age. Some have taken their child camping when he/she was only a few weeks old. I guess it’s a matter of discretion — when you truly believe the child is ready, then he/she is ready. Just make sure you bring everything the child would need to make him/her comfortable. Plan for the unexpected as well. Since kids are attracted towards bright things, they are fascinated with fire. Kids also love to copy adults, therefore, it is very likely that they will be tempted to play with fires. However, for kids fire can be really dangerous as they don’t know how to handle fire properly. Therefore, a lot of care should be taken if you are having a campfire. If you are having a campfire, one of the most important things to do for your kid’s safety is never leaving them unattended and don’t allow them to handle fire without any supervision. True, vinaya. A campfire is a camping hazard if you have a toddler with you so the key to ensuring safety is to never ever leave the child unattended because they are so active and move so fast. If they are carefully watched and we are quick to respond, no accidents can happen. Fire is one of the most dangerous disaster known to man, it’s so bad that anything burnt by fire is never recovered again and it’s going to be a painful thing to have your kid get burnt up by fire during camping probably because of the parent carelessness. So therefore, it’s very important to always supervise them when going around fire. They are kids and they are very inquisitive about the glow of fire and if not stopped they will likely be trying to touch the fire, and we all know the consequences of that action. Going with a fire extinguisher is a good idea because it will be practically handy in putting out the fire if it takes to being destructive. It’s certainly going to be fun when parents go on a campfire with their babies and kids. I’m thankful for this article especially as it regards supervising the kids when they are around the fire to avoid cases of having them burn their fingers or something of that nature. So, I will definitely have to ensure that my future kids are safe when it comes to fire in the camp when we are on a campfire outing. I have never played so well around fire before now, and I’m not planning on doing so anytime in the future. This is one of the reasons why I don’t go to hunting trips or night out camping. The truth of the matter is that I have phobia for fire, so I wouldn’t be comfortable having my kid around it as well. Camping can be very fun, there is no denying that, so I would encourage that any parent taking their kids for camping be very vigilant because fire accidents can be very devastating. last time my wife and I went to a campfire was when my wife was four months pregnant. We have not been to a campfire for a long time. Perhaps, we will go to campfire this winter. The baby will be around 18 months by them. This is a time when the children are very inquisitive by nature they want to learn at a great speed. Therefore, it is very likely that our child also wants to try so many things that might ultimately harm him. These tips will surely hep us.